Tour Times: 8:00am – 10:00am – 1:00pm – 3:00pm. Child Fare 3-8 years old: $40USD per person. Includes: transportation, entrance fees, coffee, chocolate and sugar cane tasting. You will learn all the stages, starting with the plant, the harvest, drying, toasting and grinding of the bean, then, try a cup of the beverage we enjoy every morning and during the day . This is the beverage we find anywhere and everywhere. Always tasty, always comforting. The Coffee Tour in Monteverde Costa Rica offers an interesting opportunity to learn about coffee and Costa Rican folklore. During the coffee tour, participants will learn about the history, cultivation, and operation of a functioning coffee ‘beneficio’. Visitors will have a chance to pick coffee and take part in the different steps involved in coffee production. 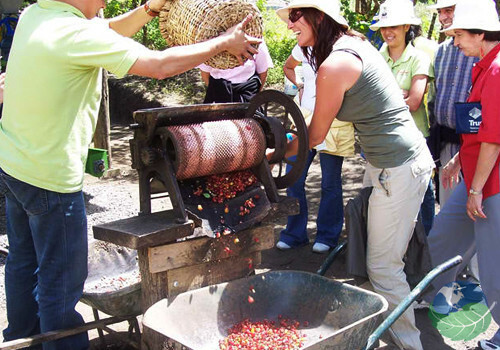 The Coffee Tour is a chance to experience first hand the tradition that is the growing of coffee in Costa Rica. The farm has a typical ox-drawn cart that you can take a ride in. The Tour lasts two hours and involves a half kilometers walk along an easy trail. The tour takes place on a coffee farm located two kilometers outside of Santa Elena – Monteverde. Finally you get to taste the chocolate that you’ve helped to make and flavor! Confortable clothes, rainjacket or umbrella.